Once upon a time, in the magical fairy kingdom of Chicago, there lived a rabbit. His name was Rabbit — George Herman Rabbit. Rabbit played baseball, and was known far and wide as the Greatest Rabbit Ballplayer. He played for the Chicago Hares, and had set many Rabbit League records, and was certain to gain admittance to the fabled Rabbit League Baseball Hall of Fame, even though the writers of the Baseball Writers Association of Animalica were mostly rubbish-headed clodpates who cared more about useless things like bunting and nebulous concepts like "energy" and "hustle" than they did about the fact that George Herman Rabbit once hit a baseball so hard he broke everybody’s bat. One day, the queen of Chicago, the lovely honey-haired hare Roma Manual, called for Rabbit. "Rabbit," she said to him, "those terrible Grumplins are hoarding all the Magic Carrots. That is not very fair! As the Greatest Rabbit Ballplayer, the duty falls to you to recover the Magic Carrots and give them to people who need them more." "Of course, your eminence," came Rabbit’s reply, and, shouldering his trusty bat, he headed off into the verdant fields of Chicago to reclaim the Magic Carrots from the greedy Grumplins. 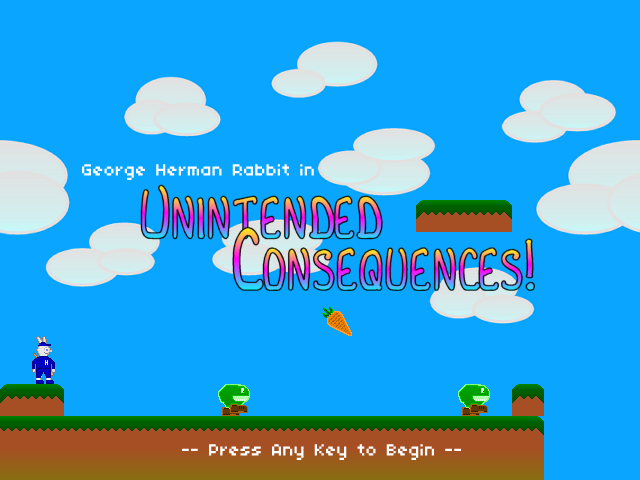 Unintended Consequences was the first game I ever wrote in AS3, developed over the course of a month for the late Super Friendship Club’s inaugural game jam. It’s not much of a game, since it was mainly a learning project; on the surface, it’s a cutesy platformer, but in reality it’s a pretentious arthouse game you’ll absolutely despise. It takes about a minute to play through. The game was made in FlashDevelop using FlashPunk. All the graphics were made by me in Paint Shop Pro 7.04 (2001 represent! ), and the music was done by the wife in some sort of MIDI-makin’ wizmo. I’m pretty proud of some of the things I managed to get done for this game; I successfully made some obnoxiously difficult platformer challenges, and I think my intended goal of portraying the character’s deteriorating mental state as he comes to terms with the effects of his actions is discernible, though it would come across better with better-quality graphics and possibly some appropriate sound effects. The immediate inspiration for this game was Eversion, which was the source of the idea about a cutsey platformer that becomes darker and darker. Another major inspiration was this Brawl in the Family strip. Use the left and right arrows to move, up to jump, and space to attack.